Alex Jones: Trump Behaves Erratically Because White House Insiders Are Secretly Drugging His Diet Cokes - Joe.My.God. “Ladies and gentlemen, I was told this by high level sources and it was evident and especially after Reagan was shot in his first year in office when he was acting like Trump, and doing the right things, that he never really recovered. They gave him cold blood, and his transfusion that causes brain damage. They slowly gave him small amounts of sedatives. It’s known that most presidents end up getting drugged. Small dosages of sedatives till they build it up, Trump’s such a bull he hasn’t fully understood it yet. “But I’ve talked to people, multiple ones, and they believe that they are putting a slow sedative that they’re building up that’s also addictive in his Diet Cokes and in his iced tea and that the president by 6 or 7 at night is basically slurring his words and is drugged. Now first they had to isolate him to do that. But yes, ladies and gentleman, I’ve talked to people that talk to the president now at 9 at night, he is slurring his words. And I’m going to leave it at that. I’ve talked to folks that have talked to him directly. “So notice, ‘Oh, he’s mentally ill. Oh, he’s got Alzheimer’s.’ They isolate him then you start slowly building up the dose, but instead of titrating it like poison, like venom of a cobra, or a rattlesnake, or a water moccasin where you build it up slowly so that you get a immunity to it, you’re building it slowly so the person doesn’t notice it. First it’s almost zero, just a tiny bit and then a little more and then your brain subconsciously becomes addicted to it and wants it and so as the dose gets bigger and bigger you get more comfortable in it. The president’s about two months into being covertly drugged. “Now I’m risking my life, by the way, tell you all this. I was physically sick before I went on air. Because I’m smart. And I don’t mean that in a bragadocious way. I mean I’m not dumb. The information you’re going to get today is super dangerous. In fact, I’m tempted just to let it out now so they don’t cut the show off or something before this goes out. I mean this is the kind of thing that gets you killed. They drug presidents because the power structure wants a puppet. 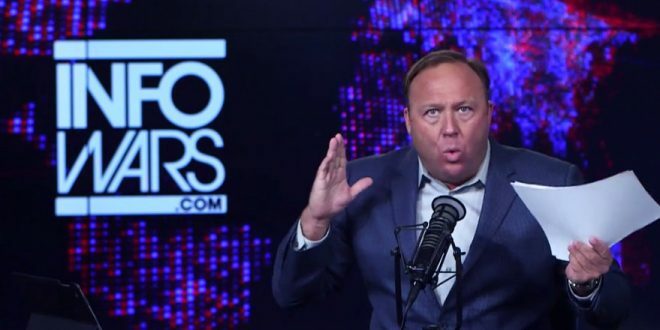 The president needs his blood tested by an outside physician he trusts.” – Alex Jones, speaking his show today, via Media Matters.